I had to go back for more Rosemary Grasshoppers! I’ve learned that whenever I have a really fantastic experience in the field, with a special critter, it is always worth going back for a second day to learn more. If you saw my original post on the Rosemary Grasshopper (Schistocerca ceratiola), you undoubtedly noticed that I was pretty excited about finally finding it- I’d been searching for months. But I only found one! My curiosity about the species was too much to bear, and I returned to the site two days later (this past Monday) to try to learn more about the Holy Grail of Florida grasshoppers! Mid-morning, I flushed a male Rosemary Grasshopper as I walked past a partly shaded Rosemary bush. He settled on an exposed branch, giving me a clear view and great photo opportunity! But right as I was about to take the first shot, he jumped, and despite several minutes of searching, I could not find him again. Bummer! It wasn’t until late afternoon that I found others. As I was beating the Rosemary bushes, something caught my eye among the moving vegetation. Something suspicious failed to jump upon my whacking of the vegetation, but remained at the tip of a Rosemary branch. 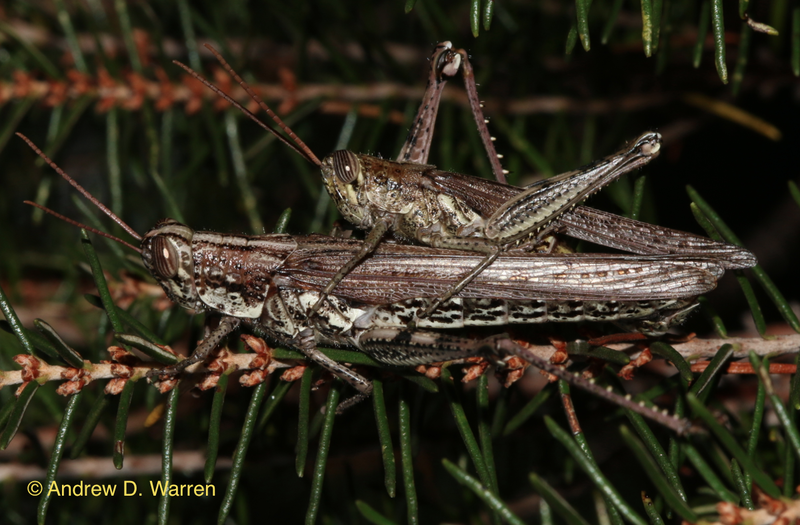 As soon as I saw it, I froze in my tracks (as if that would do any good after beating the bush with my net handle), but there, holding on tight, was a mating pair of Rosemary Grasshoppers! And they were perched in a place where I could get some photos! This pair of grasshoppers was a photographer’s dream, since they essentially refused to move, allowing me to take as many pics as I wanted! How lucky to come across a mating pair!! After I had all the photos I needed of this pair, I carefully scanned the Rosemary bush they were perched on, and found a second male just a foot or so away, also clinging to the tip of a Rosemary Branch! He was not as cooperative for photos, but I could not help but wonder if he was involved in a (failed) courtship attempt with the female so close by. Searches the rest of the afternoon turned up no additional Rosemary Grasshoppers. But I count myself as extremely lucky to have had more time observing this reclusive grasshopper, which is restricted to peninsular Florida, and learning more about its ways! 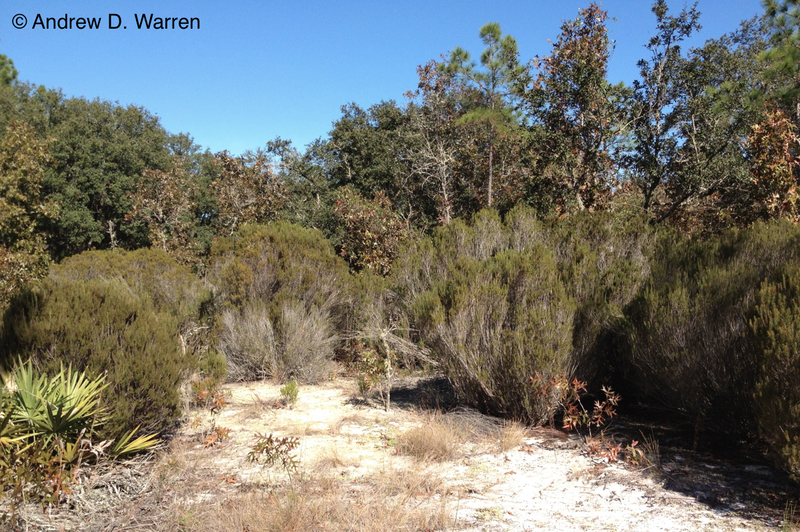 I’ll never pass another Florida Rosemary bush without giving it a long, careful examination! This entry was posted in Uncategorized on November 14, 2013 by LepScience. Great find! Persistence pays off. Money shot of a mating pair – nice!